The oddly-named Social Eating House is the latest restaurant in Jason Atherton’s empire and it’s not quite as expensive as Atherton’s flagship Pollen Street Social. Whereas Pollen Street Social has a muted, inoffensive decor suited to its Mayfair location, the Soho-based Social Eating House is a tad more adventurous with wooden floors, exposed brick walls lined with various artworks and moody lighting beaming down from handsome fittings. There are a lot of tables packed in to the relatively small space, along with a few counter spaces for single diners thrown in too. The bare floors and boisterous clientele make for a rather loud experience which won’t suit everyone. There’s an upstairs bar, with its own dedicated entrance, where you can kill you liver with lots of cocktails if you so desire. Service was efficient which was no surprise given the army of waiting staff. The relatively large menu may look rather traditional at first glance, but many of the dishes have been given an unusual and modern twist. Social Eating House’s main menu has a section devoted to jars of pâté-like snacks which feel more at home on the bar menu. 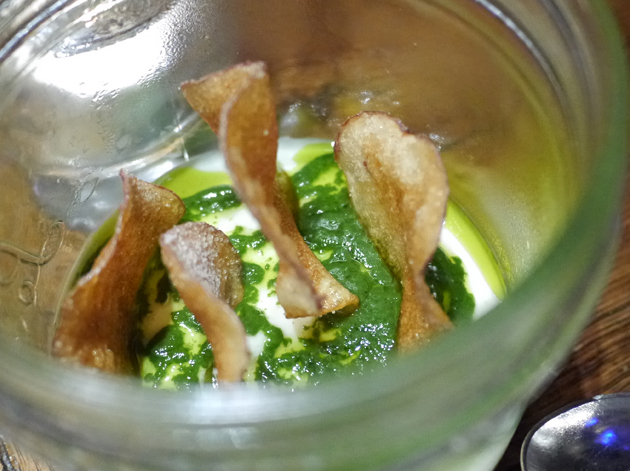 Kangaroo Face and I decided to treat them as an amuse bouche and jumped straight in, opting for two of the more intriguing sounding options – the salt cod brandade and the confit pork rillettes. 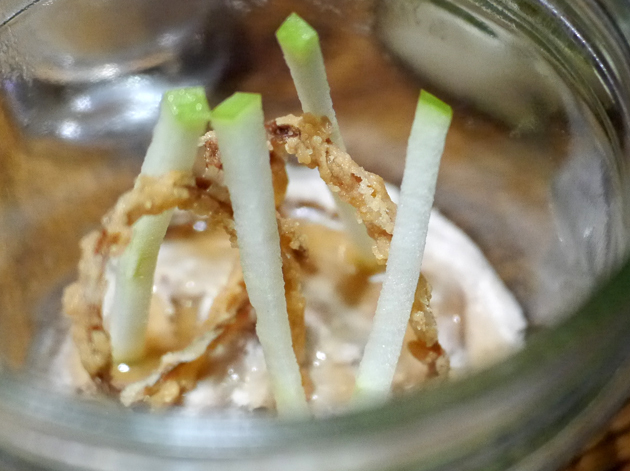 I was a little underwhelmed by the confit pork rillettes and I’m usually a big fan of anything confit. The slightly coarse but light and easily spreadable rillettes was a touch creamier and fattier than standard rillettes, but not by much. The smooth salted cod cream was far better with its gentle fishy taste and hints of fruitiness. Both were served with a generous portion of bread pre-smeared with salted butter which worked best with the salted cod. I confit in this jar. Why are restaurants suddenly putting crisps in everything? 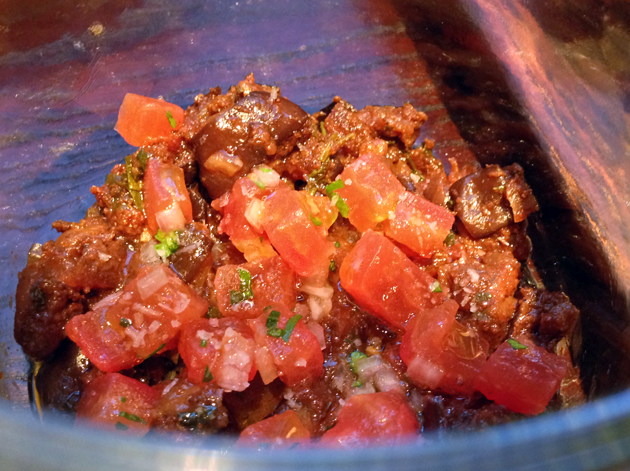 I followed up the jars with a starter of smoked beef tartare. 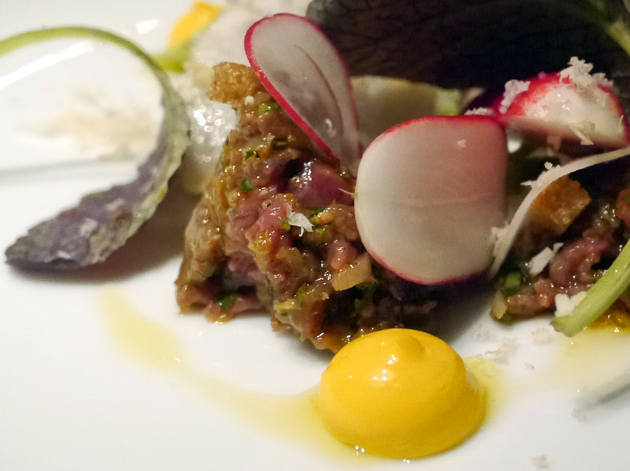 Although I wasn’t convinced that it was any better than a more traditional steak tartare, the light smoky flavour wasn’t overpowering or sickly while the raw beef had a pleasingly firm and bouncy texture. A gentle amount of heat from some horseradish added an extra hint of flavour to a competent starter. Smoking is prohibited. Or is it? 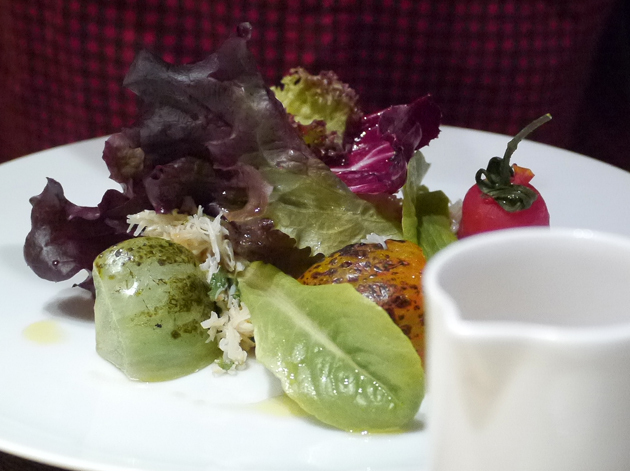 Kangaroo Face was disappointed with the presentation of his CLT – crab, lettuce and tomatoes – where the lettuce leaves were draped in a careless, unimaginative fashion over the crab and tomatoes. He would also have preferred better quality crab meat such as a claw instead of the bitty head meat. Despite all of this, the numerous ripe, punchy varieties of tomato and the smoky sweetness of the tomato vinaigrette made this a memorable and ultimately pleasing starter. Sonny, true love is the greatest thing in the world – except for a nice MLT. Mutton, lettuce and tomato sandwich, where the mutton is nice and lean and the tomato is ripe. They’re so perky, I love that. Kangaroo Face continued the seafood theme with his main course of roasted cod. The glossy flakes of fish were evenly cooked and the cream sauce made from a shellfish stock was strongly flavoured and pleasant enough. However, there just wasn’t enough contrast in either flavour or texture to hold his interest. The Picky Glutton is currently listening to Hurts. I opted for the ‘flamed’ pork chop. The thick slab of evenly cooked pig had a mildly charred exterior that had a firm bite giving way to a tender interior. The flesh had slightly salty and slightly sweet taste that was highlighted by the soy-like drizzling sauce. 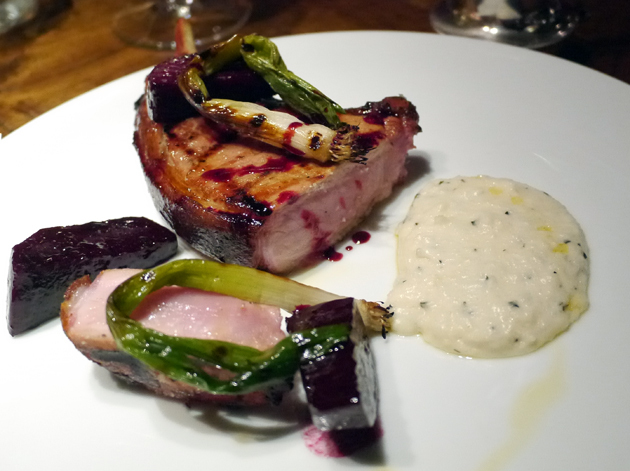 I was non-plussed by the charred spring onion and the beetroot, but the creamy polenta was far better with its grits-like finely gritted consistency. As satisfying as the pork and the polenta were, they didn’t really compliment each other and felt instead like ingredients on a plate rather than a consistent whole. Almost typed ‘flambéed pork chop’. Kangaroo Face was amused and delighted by his lemon curd pie. 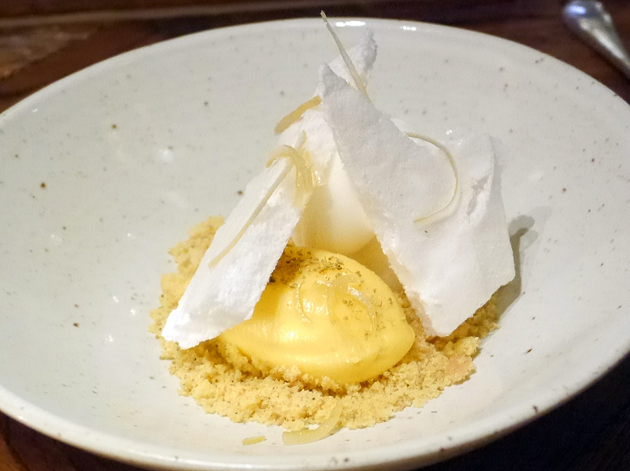 The dessert was deconstructed with the pastry crust in loose crumb form while the curd, merginue and sour yoghurt sorbet were all separated from each other. However, the thick and strongly flavoured curd overpowered both the sorbet and the sherbet-like meringue so while each individual element was tasty in its own right, they didn’t work well together. If there’s an order in which they’re supposed to be eaten, then it’s not obvious. Like a lemon curd pie, that’s amore? 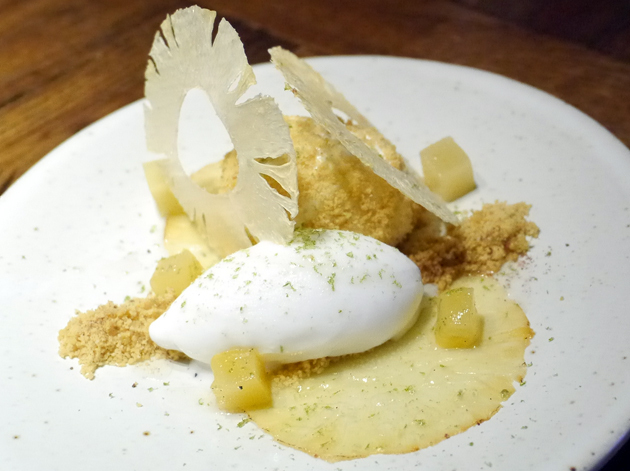 My own dessert combined some unusual ingredients not usually seen together – Szechuan pepper, pineapple, lime and coconut. The combination of Szechuan pepper and lime in the ice cream was an odd one and although the numbing heat of the Szechuan pepper had been significantly reduced, its distinctive flavour was unmistakable and made for a strangely satisfying ice cream. The dried pineapple cubes and slices resembled candy in their sugary sweetness while the coconut cream to the side was almost wispy in its lightness. However, as with the lemon curd pie, none of these elements really worked together. Has someone been cribbing from Alvin Leung? I had mixed feelings about my first meal at Social Eating House so I had to return for seconds, this time on my own. I started off with a jar of spiced aubergine. It was completely unlike the aubergine dips often found in Lebanese cuisine, instead resembling an unspicy, meat-free version of chilli con carne. The chunky, diced bits of aubergine were flecked with tomato and parsley giving it a sweet flavour – a sweetness which was hard to appreciate if spread over the accompanying slices of bread already spread with salted butter. Mushrooms on toast may sound like the dullest dish ever, but it’s far more interesting when the mushrooms appear to have been cooked sous vide. 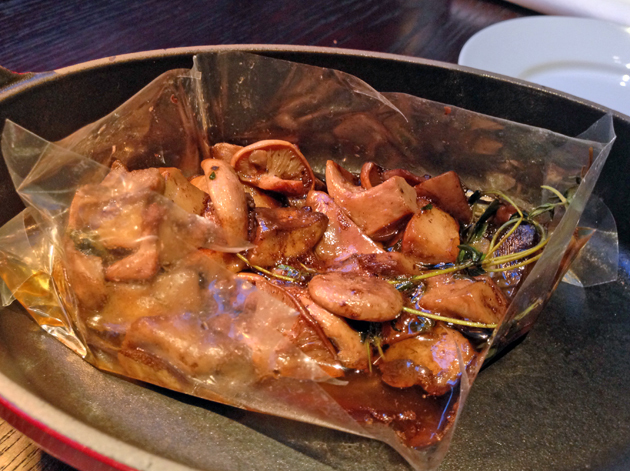 Gelonch in Barcelona sometimes serves supremely stunning meats cooked sous vide, but I was sceptical that the method was really necessary for mushrooms. While the mushrooms were tender, taut and slippery with a very muted flavour when eaten on their own, the real joy was in their intensely buttery and earthy aroma. They only tasted mildly earthy and sour when eaten on the slice of toast pre-smeared with cep purée. Choosing to purêe cep seemed odd too – part of the joy of cep mushrooms is their smooth, silky texture which was lost here. Curried hake sounds like a very heavy dish, but the soft, fluffy fish was only lightly spiced. This gentle curry flavour was enhanced by the thin but distinctly flavoured cauliflower sauce served on the side in a small pot to be poured at your discretion. A separate, thicker cauliflower sauce was poured over a firm chunk of cauliflower, enhancing that vegetable’s mildly bitter taste. 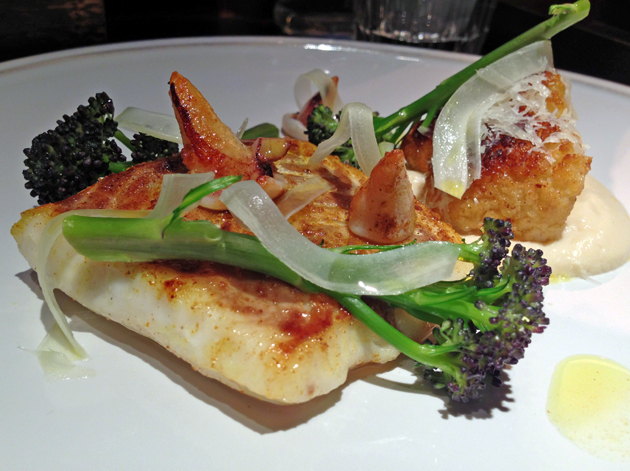 The firm cauliflower and baby broccoli provided a contrast in texture to the fluffy hake, but the baby squid and grated cheese seemed unnecessary. Kangaroo Face had almost opted for the honey almond sponge on our first visit, but decided not too declaring that he wasn’t ‘about to spend £6.50 on a sponge cake, no matter how good it is’. 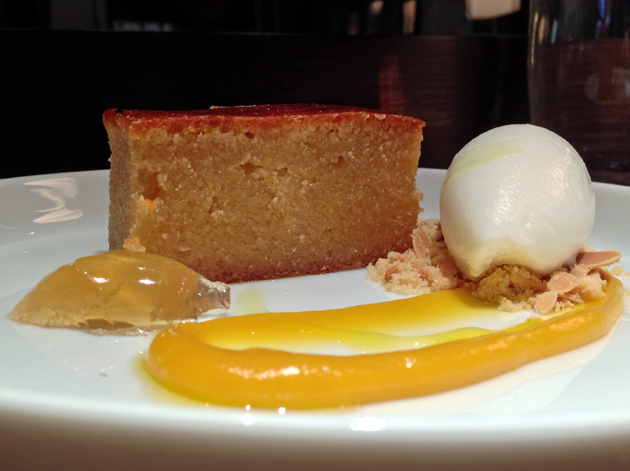 That’s his loss – the sponge turned out to be far more satisfying than either of our desserts the first time around. 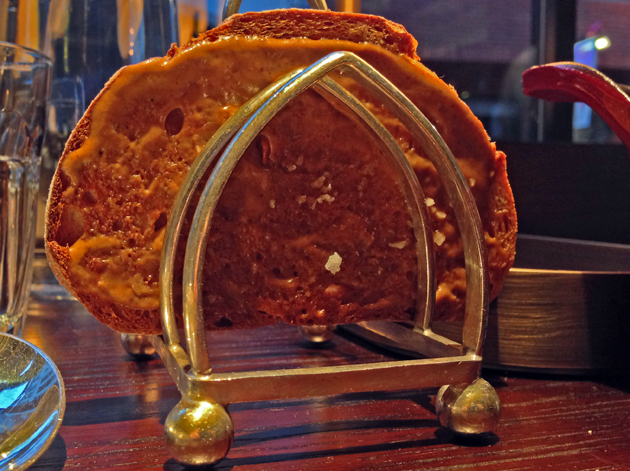 The dense, small crumbed sponge had been soaked in honey – the moist texture and light, syrupy sweetness was reminiscent of the Indian dessert gulab jamun. The crunchy almond pieces provided a counterpoint to all the softness, while a thick, tangy orange coulis provided a sweet citrusy burst. The goats curd ice cream provided a tart shot of refreshment after all those bold flavours and textures, although it needed a cleaner aftertaste to be a truly effective palate cleanser. Not all sponges are created equal. Social Eating House is already wildly popular with Soho’s sozzled, novelty-seeking bourgeoisie but I’m more ambivalent about the place. Some dishes are very good indeed, but others are merely satisfactory. Given the choice, I’d rather eat at 10 Greek Street, Newman Street Tavern or Duck Soup which are all similarly priced or cheaper. Although none of those restaurants attempt to replicate Social’s creative twists, they’re far more successful in serving up consistently good dishes. The only snag is that out of those three only Newman Street Tavern, like Social Eating House, accepts reservations. 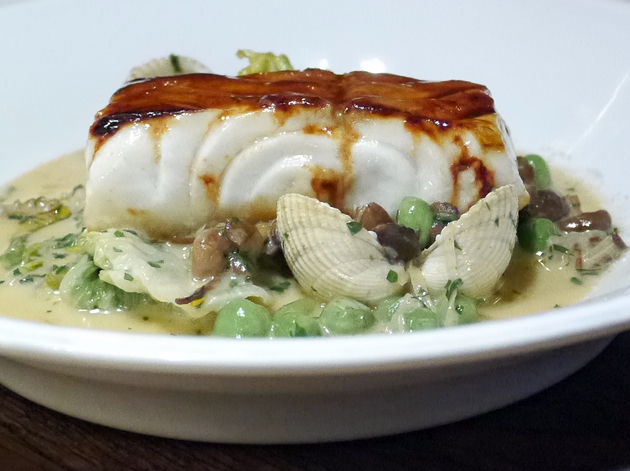 Tags: atherton, aubergine, cake, cauliflower, cod, confit, crab, curd, hake, london, mushrooms, peppers, polenta, pork, restaurant, review, sichuan, social eating house, steak tartare, tomatoes. Bookmark the permalink.